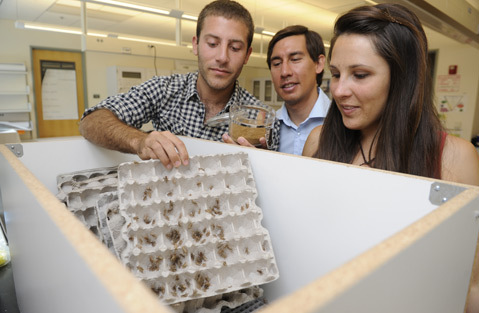 The UCSB Bren School grad students behind the insects-as-food project called Slightly Nutty weren’t the first people to realize that ground-up crickets make for a nutritious treat, as a handful of companies have grown the domestic market from nothing to more than $20 million in just a few years. 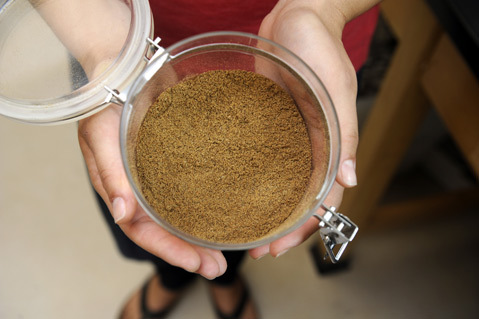 But Tyler Isaac, Jacob Skaggs, and Megan Miranda may make this fast-growing trend truly sustainable, which is likely to trigger a new global industry and put the protein-rich cricket powder into everything from cookies and pasta to pet food and fish farms. The Slightly Nutty team of, from left, Tyler Isaac, Jacob Skaggs, and Megan Miranda say that cricket protein is "astronomically more efficient" than beef and other meats when it comes to water and food required to grow. A native of West Hartford, Connecticut, who got his undergrad degree at Boston University, Isaac was initially drawn to insects as an alternative aquaculture feed while working at a fish farm in the Bahamas. He decided to pursue a master’s in environmental science and management at UCSB because of the Bren School’s innovative Eco-Entrepreneurship, or “Eco-E,” program, which encourages students to tackle environmental challenges by building economically viable businesses. That’s where, in fall 2013, he met Skaggs, 34, a Peace Corps veteran who still works on East African initiatives, and then Miranda, 25, a Big Island of Hawai’i native with a background in agriculture who joined the team in March 2014. 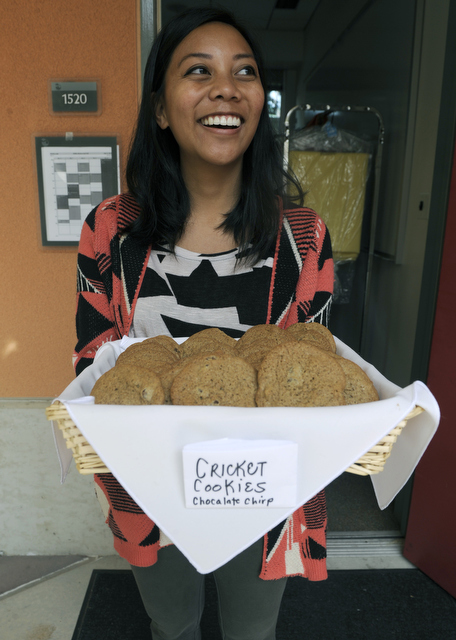 Bren School student Jennifer Sajor gets ready to pass out "Chocolate Chirp" cricket cookies. 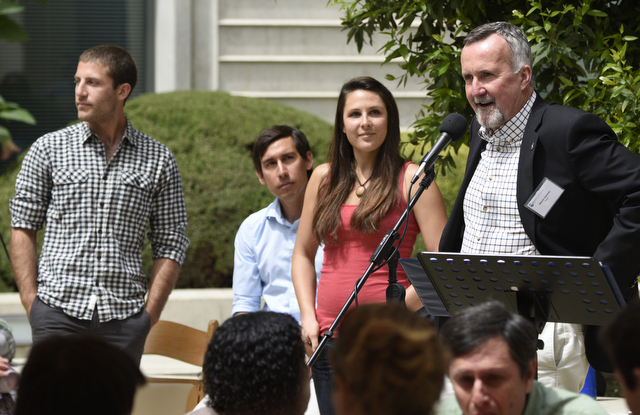 The UCSB Bren School's Steve Gaines (right) introduces the Slightly Nutty team of Tyler Isaac, Jacob Skaggs, and Megan Miranda on April 10. With such a wise wind at their backs, protein bar companies like Chapul (whose founder Pat Crowley appeared on the TV show Shark Tank in 2014) and Exo continue pushing cricket flour into a premium category, and there seems to be less “ick factor” associated with ground-up bugs. Plus, thanks to Jiminy Cricket, Americans aren’t so freaked out by them. “It doesn’t sound as scary as, ‘Would you like a fly larvae burger?’” said Isaac. The team’s next step, as dictated by the Eco-E program, was to investigate the current market and identify the environmental and economic problems. In the crickets’ case, the main sustainability hurdle was the type of feed being used — the current companies rely on chicken-feed-like meals that use water-sucking base ingredients like soybeans and whey, not to mention animal byproducts. And economically, the price of $20 to $25 a pound for wholesale cricket flour remains too high to be anything other than high-end people food, as whey, for instance, remains nearly half as cheap. 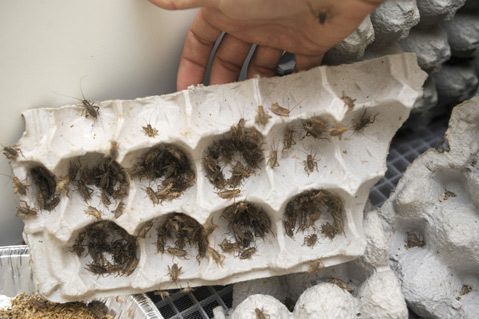 Thousands of crickets grow to about six weeks of age on egg cartons in the Bren School's Eco-E lab before harvest time. 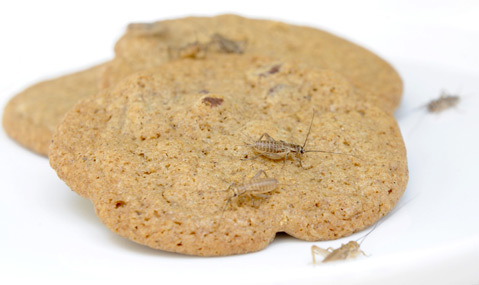 A cookie made of cricket flour. That’s the kind of comment commonly overheard in the Eco-E lab, where green-earth concepts like “closed-loop system” and “conservation planning” appear in the same sentences as green-money ideals of “opportunity analysis” and “first-mover advantage.” Upon graduation this June — and a hopeful win at UCSB’s New Venture Competition at the end of April — the Slightly Nutty team plans to incorporate the company, put their research into work, get some money in the bank on crickets (Chapul and Exo both indicated they will buy the flour), and then expand into other insect proteins to fulfill agriculture and aquaculture needs.